Added 3.5.2011. Minor edits 28.2.14. Photographs added 14.5.16. Born in Shoreditch, London c.1824. Enlisted at London on the 16th of May 1842. Henry Taylor, 27, Private Soldier, born London. Next of kin (in 1854): Mother, Rebecca Taylor, living in St Ann Street, Soho, London. Lummis and Wynn state that he was promoted to Sergeant, but no proof of this can be found. Discharged from York on the 26th of May 1866, at "Own request, after 24 years' service." Aged 42 years 6 months on discharge. Served 24 years 11 days. In Turkey and the Crimea: 2 years. Conduct: "good". In possession of five Good Conduct badges. Never tried by Court-martial. To live in Chelsea after discharge, but he was living in the North London Pension District in 1875. Awarded the Long Service & Good Conduct medal on the 13th of January 1862, with a gratuity of £5. Documents confirm the award of the Crimean medal with four clasps and the Long Service medal. Present at the first Balaclava Banquet in 1875. 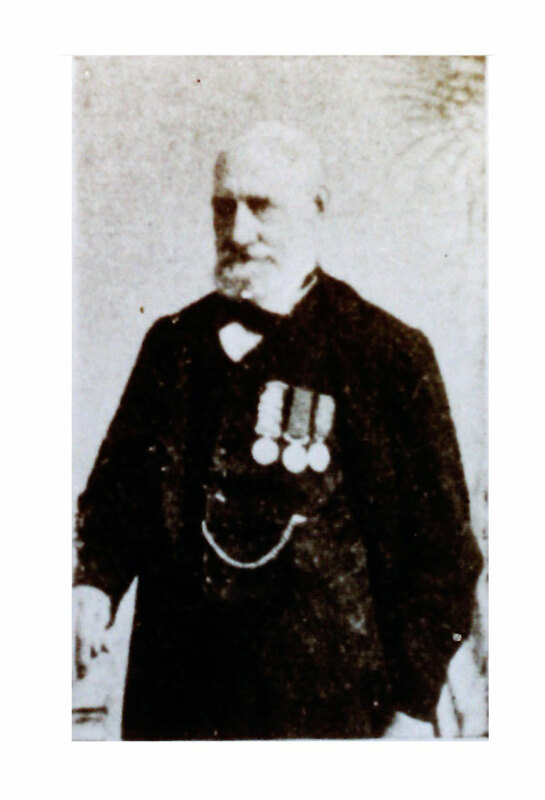 Member of the Balaclava Commemoration Society in 1877 and 1879. At the Lord Mayor's Show on the 9th of November 1890, a "Pte Taylor" is shown in the 16th carriage in the procession. This could be 1141 Henry Taylor, though 1200 John Taylor, of the same regiment, is another possibility. Attended the Annual Dinner in 1899. Received some help from the Roberts Fund. He is shown on the list of Balaclava Survivors in 1907. 106, Grafton Street, Mile End Old Town, London. Henry Taylor, aged 57, a Chelsea Pensioner, General Labourer, born at Shoreditch, London, with his wife, Lily M., aged 37, born at Kennington, London, and three children: two boys of school age and a daughter aged 1 year [Henry 6, Frederick 5, Grace 1]. 58, Antell Road, Bethnal Green. He was convicted at the Stratford Petty Sessions on the 2nd of September 1898 for "Exposing his person", and sentenced to one month's imprisonment, with hard labour. His pension was suppressed while he was in prison. 95, Mayville Road, Leyton, Leytonstone. Henry Taylor, 78, Army Pensioner Cavalry, born Shoreditch. Lily M., 56, born Kennington. Albert, 16, Coal Merchant Clerk. Henry Taylor, 85, December Quarter 1907, West Ham. His death certificate shows that he died from Bronchitis, aged 85 years, at 95, Mayville Road, Leytonstone, on the 14th of December 1907. He was described as an "Army Pensioner". An Albert E. Taylor, son, of the same address, was present at his death. There is a copy of the death certificate in the 13th Light Dragoons "Certificates" file. "On Saturday afternoon the funeral took place of Trooper Henry Taylor, late of the 13th Light Dragoons, at Woodgrange Cemetery, East London. Trooper Taylor went through the Crimean War, receiving medals and clasps for a number of engagements. He was 86 years of age and had resided in Leytonstone for some time. He was in receipt of a pension from the Balaclava Relief Fund." Death of a Balaclava Hero — Took part in the Famous Charge. Another of the very few survivors who took part in the famous charge of the Light Brigade at Balaclava has gone to his rest. Mr. Henry Taylor, of No. 98, Melville Road, was one of the oldest Crimean veterans, and although he was 85 years of age and had in his younger days gone through sufficient of life's vicissitudes to kill an ordinary man, he showed remarkable vitality almost up to the day of his death, which took place last Saturday (the 14th). Mr. Taylor was formerly a trooper in the 13th Light Dragoons (later the 13th Hussars) and went right through the whole of the Crimean War, which proved almost as disastrous for the victors as it did for the defeated. Amongst our additional notes today we refer to the salient features of that terrible campaign and the battles in which Trooper Taylor took his part. He was present at the Alma, Inkerman, Balaclava and Sebastopol, and was one of the gallant light cavalry, numbering 607, who in obedience to a misconception rode with their sabres drawn, on to the Russian batteries. Less than 200 men returned from this memorable and tragic feat, and one of those was Trooper Taylor, who had his horse shot under him, but he himself escaped unscathed. He held the Crimean medal with four clasps, the Turkish medal and the medal for long service and good conduct. Referring to his military experiences he used to say "he was married to the Queen for 25 years." Certainly her Majesty had no more gallant and devoted a soldier. Up to the last, Mr. Taylor was in possession of his faculties, and could read letters without the aid of glasses. Through the influence of Mr. T. H. Roberts of No. 158 Fleet Street (the Balaclava Charge Fund) he was able to live in comparative comfort for his last few years. The funeral will take place tomorrow (Saturday) at Woodgrange Cemetery." "Balaclava Hero's Funeral — On Saturday last the remains of the late Trooper Henry Taylor, whose sad decease we announced last week, was interred at Woodgrange Cemetery." He was buried in Grave No. 4316, Square 40. 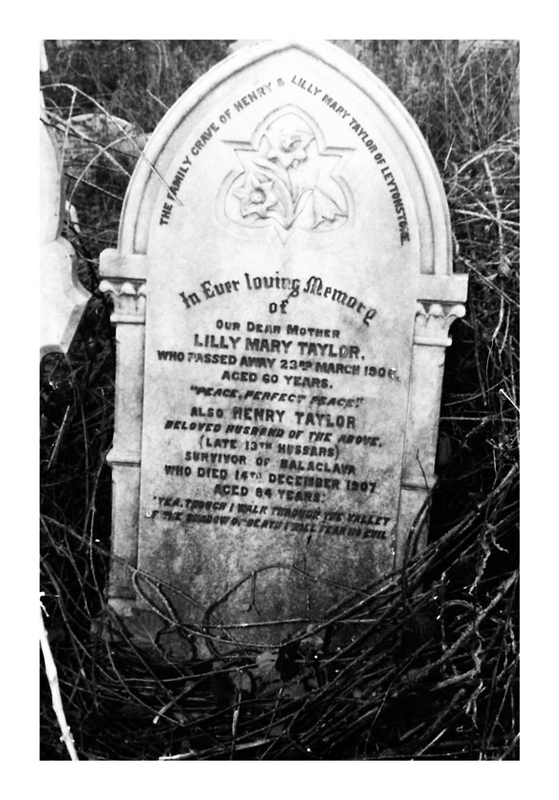 "The family grave of Henry and Lilly Mary Taylor of Leytonstone." "In everlasting memory of our dear mother, Lilly Mary Taylor, who passed away 23rd of March 1906, aged 60 years." "Also Henry Taylor, beloved husband of the above, late 13th Hussars, Survivor of the Balaclava Charge, who died 14th December 1907, aged 84 years." "Yea, though I walk through the valley of the shadow of death I feel no evil." The owner of the grave-space is shown as Albert Taylor, of 95, Mayville Road, Leytonstone, E11. An article in the Daily Mail, 23rd of March 2000, showed scenes during the re-development of the three-acre graveyard for the building of 120 luxury flats. It was estimated that between 12,000 and 15,000 bodies would be removed for re-interment in the part of the original 27-acre plot that remains. Enquiry of the Cemetery authority shows that Henry Taylor's gravesite could be affected if obviously not maintained. Woodgrange Park Cemetery has its very own Act of Parliament, which is correctly titled Woodgrange Park Cemetery Act 1993. We are the only cemetery whom to date in the UK can acclaim such an achievement, the Act was granted after many years of legal battles between us the Friends of Woodgrange Park Cemetery and government members to stop the ever desire of the cemeteries present owners Badgehurst Ltd to sell off the land to property developers. Many years of lobbying, petitions and days were spent by the original members of the Friends of Woodgrange Park Cemetery and all of their time it must be noted, was given freely to support a cause, of honouring the many family members who have been interred within the cemetery over its long history to not to be disturbed. But unfortunately we were not successful in all that we strongly petitioned for, it is with great sadness that a small part of the cemetery was sold off for the development to make way for a small housing estate to be built on the north east end of the cemetery grounds. As for the remains that were taken from this area of the cemetery, we are pleased to inform everyone that these remains were interred into another area of the cemetery, which is now known as the Memorial Garden of Remembrance. Registration of death, and Census information for 1851, 1891 & 1901, kindly provided by Chris Poole.